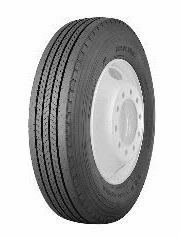 Five rib design to give lower rolling resistance, minimize uneven wear and reduce running temperatures. Round shoulder with shoulder blades help reduce chamber wear. Four full belt crown construction increases casing stability and retreadability.